While it's certainly true that the quickest and easiest gyros at the neighborhood Greek joint or "House of Pizza", the vast majority of take out gyros are made with some weird, processed, sausage-like mystery meat. There is no reason you should have to settle for those when really delicious gyros are so easily (and quickly) made at home. Real thick pita bread - Not the sandwich pockets. Real thick and puffy pita bread can sometimes be a bit hard to find, (Costco sells it) but plain Indian naan bread is equally good and more readily available (Whole Foods sells it). NB: I purposely did not give amounts because this is the kind of dish where you can pretty much wing it, but if it helps, to serve four I bought; 1.3lb of Chicken used the juice of one whole lemon and 3 garlic cloves for the chicken and marinade. Cut chicken into thin short strips and place in Ziploc freezer bag with; the juice of the lemon, dash of oregano, S&P, a few cloves of minced garlic and olive oil. marinate for 1/2 hour or so. If you are making your own tzatziki, make it now. Brush pita or naan bread with olive oil, salt and pepper. Warm naan bread one at a time in grill pan (or grill) until nice and pillowy with nice grill marks slightly charred. It is pretty easy to do this while you are searing chicken if you are quick and pay attention. cover the pita with foil to keep it warm. If you are not doing this step concurrently with chicken, put the cooked chicken in a 200 degree oven to keep warm. 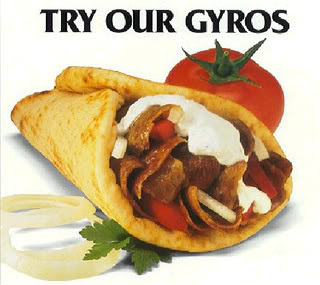 Diners assemble their own gyros like tacos, with chicken on pita topped with tzatziki, feta and tomato & onion mixture. I will sometimes as some Romain cause that's the kind of guy I am. The whole process takes a little over a half hour.